We are delighted to welcome JiaRong Li, of the New England Conservatory, who is providing piano accompaniment for our worship services this semester. As well as leading our hymn singing, JiaRong provides several solo pieces during worship to enhance our spiritual experience. 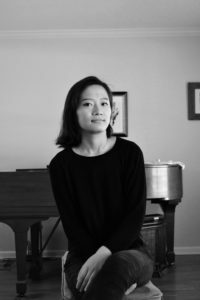 JiaRong specializes in classical, soft, slow, spiritual pieces, by composers such as Bach, Handel and Chopin. Music is a key aspect of our worship service. We generally sing traditional protestant hymns, as well as a selection of African American spirituals, gospel music, chants and songs of various cultures. Musical reflections and responses are integrated into the service, to give the congregation the time and space they need for meditation. As with all aspects of our worship, the music is not a performance for entertainment, but inspiration for our spiritual experience.